The MMORTS is where the past and present of strategy games meet; the past, because many of these games derive from the real-time-strategy and ‘god’ games of the nineties, and the present, because these games are designed to thrive in a multi-platform, always connected world. These are games where you build cities, raise armies, and battle rival nations, but where you’re playing alongside – or against – dozens, hundreds or thousands of players at the same time. Picking out the best MMORTS games to recommend is something of a minefield, not because there aren’t enough of the games – they are legion – but because it’s a genre that sits outside the world of mainstream gaming, tied to neither console, PC, nor gaming laptop. Many of the best-known examples are browser-based or mobile games, while the majority are free to play. This means, of course, that many use underhand tactics to push you to pay real cash or adopt a pay-to-win mentality. We’ve tried to focus on games that rise above this, or at least make it clear where your wallet might get whacked. The classic mobile multiplayer RTS is still arguably the best, thanks to Supercell’s insanely addictive mix of village-building and battle. Recent updates have revived the building and added new troop types, and whether you’re defending your village or battling against the goblin king, there’s no end of fun to be had. As the name suggests, though, Clash of Clans only peaks when you join a clan with like-minded players and team up against your rival clans, using all the heroes, spells and troops at your disposal. A game that looks simple and cartoon-like on the surface, Clash of Clans has hidden depths, with new strategies emerging all the time. And while its pay to win mechanics have grown more aggressive, you don’t need to splash out big money to enjoy the game. Hailing from Firefly, the studio behind the classic Stronghold series, Kingdoms makes you lord or lady of a medieval settlement, where you can build your village, construct your castle, then fight for your place in a massive multiplayer online world. You can farm and trade with your fellow aristos, forge links or do battle with your neighbours or join a faction and push for control. This is an online version of a classic, complete with massive sieges, politics and a complex research tree to explore. What’s more, there’s cross-play between PC, iOS and Android players to keep the PvP action alive. Just be prepared for the old-school graphics and some pay to win shenanigans along the way. Kingdom Wars is a free-to-play fantasy MMORTS with a difference. Not only does it have relatively modern 3D graphics – a rarity in a genre where most games look twenty years old – but it goes easy on the pay to win stuff. You can cough up cash for cosmetic articles or single-use perks, but you won’t be splashing out just to make the build timers speed up. Playing as orcs, elves or humans, you construct towns and strongholds, defend your kingdom from attack and raid the neighbours, with the occasional quest on the side to keep things interesting. The city-building and fortification is deliberately kept simple, so that you can focus on the battlefield rather than micromanagement, and there’s scope to build your own global empire. There’s still a steep learning curve to contend with, but the friendly community helps a lot and there are single-player campaign and skirmish modes to help you get up to speed. 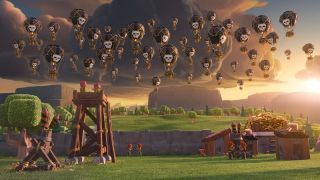 Okay, so Supercell’s MMORTS without Clash in the title still has a lot in common with Clash of Clans and Clash Royale, but what does it matter when Boom Beach gets so much of the fun stuff right? This time you’re the commander of a squad of soldiers washed up on an island paradise, where you’ll build your base, train new troops, upgrade your facilities and defend. Sniper towers, machine gun nests, cannons and mortar will all be needed to stop the evil Blackguard forces from wrecking your hard work. And while you’re competing with your fellow players for resources, you can also work with them to take the battle back to Blackguard, liberating grateful natives and sharing the spoils between yourselves. There’s still a bit too much splashing out required to speed up upgrades, but Boom Beach is fast-paced, exciting and stupidly addictive – possibly even more so than its illustrious stablemate. Even in Steam Early Access, Foxhole is a fascinating MMO/strategy/action hybrid, pitched as a sandbox wargame where every player does their bit to determine the outcome of a long-term war. Viewed from a zoomed-out, third-person perspective, every individual soldier on the epic, persistent battlefield is a player, but you don’t even have to fight to contribute to the war. Play as a logistics officer, and you can manufacturer supplies and get them out to the front lines. Play as the field commander, and you can run communications and set objectives for the troops. And if you’d rather build fortifications and defences, keeping the enemy away from your bases? Well, that’s good too. Foxhole has some balancing and gameplay issues to work out, but this could be a new kind of MMO. Think of Total War Battles: Kingdom as a streamlined version of Creative Assembly’s grand strategy wargame series, with the tactics toned down to make the action more accessible. You’re a lord in a persistent, medieval England, expanding your small settlement with farms, quarries and logging camps, then building the military and religious buildings you need to keep making progress. Before long you’ll have spearmen, knights and archers under your control, fighting not just computer-controlled opponents but rival lords. And while the battles don’t have the in-depth strategy you’d find in the full Total War games, they’re still spectacular and interesting. Cleverly, you can play the same game across devices, logging out on your PC and in on your phone or tablet to keep playing on the move. Despite some pay to win and deliberate delay mechanics, this is a solid online RTS. If one developer is synonymous with the Free 2 Play MMORTS, it’s Plarium: the studio behind Stormfall: Age of War, Vikings: War of Clans and Throne: Kingdom at War. All three games have their upsides – like accessibility, slick gameplay and visual polish – but also downsides in terms of the expensive bonus items and boosts you’ll need to get anywhere fast. Throne: Kingdom at War is the best of the bunch, with a good mix of kingdom-building, questing and action-packed real-time battles, plus a style that shows someone has been watching Game of Thrones. Join an order with other players and you can raid your enemies’ castles. Victory won’t come cheap and the delays soon get annoying, but this is a big and relatively satisfying MMORTS.